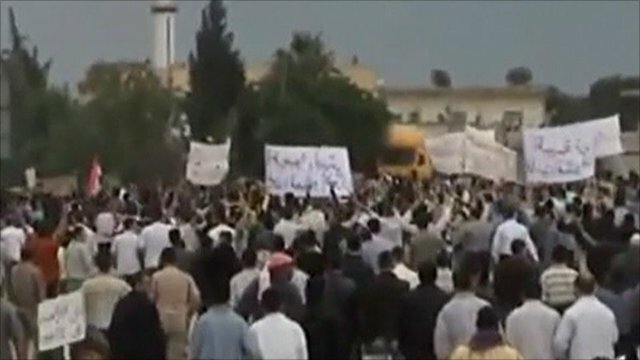 Reports from Syria say columns of tanks have moved towards the central city of Hama, which has been the scene of anti-government protests in recent weeks. There have also been arrests in the nearby city of Homs, and in the coastal town of Baniyas, where a crackdown by troops is continuing, activists say. Earlier, the UN said it was concerned it had been unable to get humanitarian aid to the embattled city of Deraa. Deraa has been cut off for two weeks. Dozens are said to have been killed. Meanwhile, the European Union has announced an embargo on exports to Syria of arms and equipment that could be used for internal repression. The bloc also imposed a visa ban and asset freeze on 13 officials and associates of the Syrian regime identified as being "responsible for the violent repression against the civilian population". "The aim of these measures is to achieve a change of policy by the Syrian leadership without further delay," said EU foreign policy chief Catherine Ashton in a statement. President Bashar al-Assad is not on the sanctions list, but it does include his brother Maher, who heads the Republican Guard and is believed to be overseeing the crackdown, and their influential cousin Rami Makhlouf, who is one of Syria's richest men and has been accused of bankrolling the regime. An adviser to President Assad has said she believes the government has gained the upper hand over the protesters. "I hope we are witnessing the end of the story," Bouthaina Shaaban told the New York Times. "I think now we've passed the most dangerous moment. I hope so, I think so." The government says it is combating an armed insurrection by "armed terrorists" and has deployed troops and tanks to protect civilians. On Monday, the army moved into the western Damascus suburb of Muadhamiya. A human rights activist told the BBC that at least three people were killed and many others wounded in clashes. About 200 were arrested, he added. Security forces are continuing their efforts to crush dissent in Homs, Syria's third city. Hundreds were arrested as troops divided up the city to prevent any mass protests, activists said. Electricity and telephone lines were also cut. Gun and tank-fire were heard but the number of casualties was unknown. On Tuesday, a resident of central Homs told the BBC that there were no longer any armed security personnel on the streets, but that people were still being arrested. Activists also said that more than 250 people had been arrested in Baniyas, including a 10-year-old boy. Water, electricity and telephone lines were cut, and tanks were deployed on roads leading to the town, they added. Foreign journalists have not been allowed to enter Syria, so reports from the country are difficult to verify independently. In central Damascus, a small group of about 100 youths sang protest songs on Monday evening in Arnous Square as shoppers bustled around them. They called on the army to "stop the gunfire", end the sieges of flashpoint cities such as Deraa, and said national dialogue was the solution. But plainclothes security men moved in and broke up the gathering, bundling the protesters roughly into vans and driven off, amateur video footage showed. Later, unverified footage was published on the internet showing columns of tanks moving towards Hama, to the north. The BBC's Jim Muir in Beirut says Hama was virtually wiped out in 1982, with tens of thousands killed after an uprising by the Muslim Brotherhood. There have been protests in the city in recent weeks and now there are fears that it may be subjected to the kind of crackdown already being felt in Homs, Baniyas and Deraa, our correspondent says. Meanwhile, the UN said it was increasingly concerned about the situation in the southern city of Deraa, which has been cut off since troops and tanks were deployed there two weeks ago. Image caption Syria's government says it is combating an armed insurrection by "armed terrorists"
A humanitarian mission was to go there on Sunday following a request by UN Secretary General Ban Ki-moon, but access was refused. "We were expecting to go in with a mission to Deraa yesterday. That was postponed by the government," the UN Under-Secretary General for Humanitarian Affairs, Valerie Amos, said. She said no reason had been given, but added that she had been assured relief teams would be allowed to "go in later this week". The UN Relief and Works Agency (Unwra), which looks after the 30,000 Palestinian refugees in the Deraa area, has also not been able to get emergency medical supplies through to them. The agency said it was particularly concerned for 120 patients there who depend on it for supplies of insulin. "It's a matter of life and death, and that is why we call for immediate humanitarian access and are working with the relevant Syrian authorities to send a team to the area," spokesman Chris Gunness told the BBC. Officials said last week that troops were being pulled out of Deraa, where dozens of people have been reported killed and many hundreds arrested. On Tuesday, an activist told the Associated Press that tanks had entered several nearby villages shortly after midnight. He heard heavy shooting, but it was not clear if there were any casualties. The Syrian Observatory for Human Rights says 621 civilians and 120 security personnel have been killed since demonstrations pro-democracy protests began in March. Another Syrian rights group, Sawasiah, says more than 800 civilians have been killed. Officials dispute the civilian toll and say about 100 soldiers have died. The unrest poses the most serious challenge to President Assad since he succeeded his father, Hafez, in 2000. 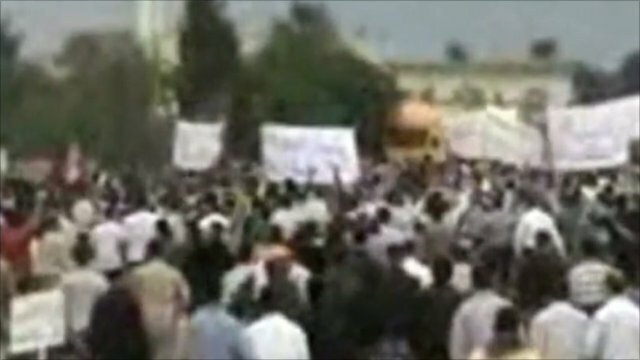 A mobile phone snapshot, reportedly taken in Qamishli on 29 April, shows protesters carrying banners written in Arabic and Kurdish demanding democracy. Razan, who is a resident of Damascus, tells the BBC about violence and protests around Syria. This unverified video seems to show a peaceful protest in Talbisah. Moments into the footage, tanks fire on unarmed civilians. Wyre Davis reports. Residents of Deraa walk past a burnt-out building. It follows shelling by troops in what human rights groups say was an intensified crackdown on protests in recent weeks. Syrian army vehicles were photographed near Homs and broadcast on the Syrian opposition internet channel Sham SNN on 11 May. Are you in Syria? What is happening where you are? Send us your pictures, videos and comments using the form below.